So the first, extra virgin fresh look at the enhancement pass is here. Some classes will be released on a weekly basis so that players can check a set amount of classes out, take them for a spin, evaluate what they think before being presented with another bunch of classes. As you can see by this image there’s a race based one and 2 PrE based ones. There also seems to be another for something ‘general’ but for most part you can’t even pick it (at least I hope it’s very general because otherwise arti’s are screwed). As you see above you have a similar set up like with Destinies – you spend so much points to go up a tier and there are specific unlocked benefits at the bottom. With one major difference – in order to get tier 2+ bottom autogrant you need to spend actual points. That’s different from destinies where each level of tier unlocks a new autogrant. In this case the first is always free while the others require investment. And that’s where you’ll find some of the PrE or special stuff. It’s good and bad. You can’t skip certain things in order to say get the strength or whatever stuff. That is if you want a specific ability like the cap stone you’re forced to buy all the other stuff before it. Spending lots of points on things you’ll rarely if every use. Not entirely different from the old system but this lacks even more flexibility. Take Horc fighter for example. You can’t just buy racial strength stuff anymore – you HAVE to invest in their worse abilities like that rage thing where when they take so much damage they’ll get stronger. I always take the first, but rarely ever anything else since there’s such a remote chance that a horc will live long with 10% health left, so that +8 strength hit before you die is a complete waste. Now in order to get the better feature you HAVE to invest in stuff you don’t like. Not really different from say Kensei where you had to invest in some really worthless things to get the different PrEs. As you can see Arti’s will now be able to run with the rune arm charged without being slow. if you invest a maximum in the Battle Engineer. On the other hand you can’t invest in specific spell powers, in fact there are none to pick in any of the PrEs. There might the general one coming (the empty window). A cool thing however is that you can invest in BOTH PrEs – getting partial in both, or full in one and some in the other. it’s fairly easy. That also includes those PrEs specials that leads to the cap stone. But there’s a definite drawback. 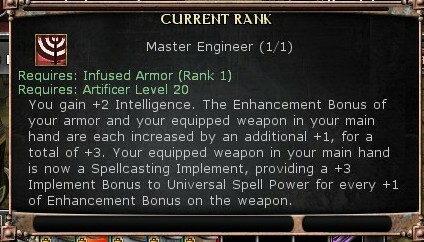 The capstone for example the Arti is no longer that clickies is treated as level 20 – unless (sorta) you invest completely in the Arcanotechnician special power and there’s no way you can have both that and the battle engineers Master Engineer. Granted, there are a lot of other things in the different PrEs that are hit and misses, but the Arti won’t be the master of all of his domain anymore – just more of one type of flavor. 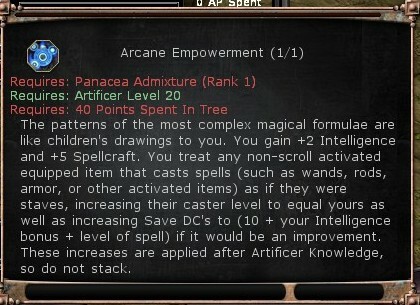 The bad thing of course is that IF there is a general enhancement tab it’ll be even less flexible to say invest in spell power specific stuff and these PrEs – especially if you want to be the best in say acid. if you also want to be the best ranged you’ll have VERY few points left to make your rune arm anything good. And without spell powers the rune arm is nothing. Plus in the racial tab you’ll find up to 3 points in DC, but it require basic tier 1 investments first. True – this is just the beginning and once people start experimenting with different builds the process might get ‘clearer’ but right now it feels like 1 step forward and some backwards until I feel jarred about all the possible prospects. This entry was posted in Uncategorized and tagged DDO, gaming on April 12, 2013 by patang01. Just one correction for you though: Your 3rd panel is blank for one of a few reasons. Either the class/multiclass you are testing doesn’t have 3 PrE’s to choose from, or the class isn’t in this week’s preview. For example, If I was testing a fighter/rogue split, I’d see Kensai and Stalwart, but not see any of the rogue stuff since rogue isn’t up yet. BUT, if I test my ranger/ftr/rog I would (and do!) see the option to fill the 2nd and 3rd panels with either of my other ranger PrEs or either of the two fighter ones, but still no rog. Long story short, the 3rd panel isn’t bugged, it’s just not always available for the class/multi you’re testing right now. I almost want to install the Lamannia client to see how this new system will affect my monastery of Monks. I fear the worst. the last is actually for a third PrE, which apparently Artis don’t have. NO class has any spellpower boost in it – those’re now provided… by skills. Yep, skills. Heal for positive/negative spells; Repair for Repair/Rust; Perform for Sonic; and the new skill of Spell Lore for everything else. My ranger/rogue isn’t terribly impressed with the new system.